The discussion around electronic invoicing has picked up considerable momentum in recent weeks. This topic was the subject of discussion at the “Digitaler Staat” (Digital State) Expert Congress in Berlin, the BME eSolutions Days in Dusseldorf, and the Berlin E-Invoicing Congress. In Germany alone, the savings potential for printing, sending, franking, added to the corresponding receiving process, amounts to billions of EURO per year. 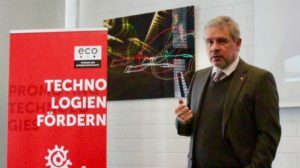 “Today we have acceptable standards for issuing, receiving, and archiving e-invoices,” says Prof. Georg Rainer Hofmann, Leader of the Competence Group e-Commerce at eco – Association of the Internet Industry. “Substantial progress is being made in the areas of integrating existing enterprise resource planning, content management, and archiving systems,” Hofmann continues. Training programs for users which are run neutrally, but in close contact with system and service providers. Many staff members of companies and authorities lack the expertise to integrate the systems and use them for their own organization. Users must be convinced of the reliability of the systems and the trustworthiness of the system solution providers – only then can they benefit from all the advantages of electronic invoicing. Close contact with the providers of the respective solutions and training of employees are therefore key instruments for supporting more widespread acceptance. More precise tailoring of the solutions to the needs of the users in everyday practice. The application systems, the electronic invoice formats, and their transmission and archiving must meet the requirements of everyday practice. Any further work on progressing e-invoicing standards must keep their usability in focus and tailor these even more closely to user needs. What is also required here is a re-opening of the discussion on hybrid formats and their use, as well as a specialist exchange of relevant experiences within the Internet industry and amongst stakeholders and initiatives. Those in positions of responsibility should therefore carry out surveys and investigations that determine more precisely the needs of customers and suppliers. In terms of the further digitalization of processes, cloud solutions are also an important component of the concept. Certify quality of the systems by means of a quality seal. The fact that official European standards and formats for data transmission in e-invoicing are being created is a positive development. For users, transparency and comprehensibility concerning how correctly and securely the system providers implement these standards is important. To this end, the eco Association suggests that quality standards linked to quality seals should be created, with a view to certifying that systems are reliable and providers are trustworthy. Such measures would also serve to strengthen acceptance and trust in e-invoice solutions among small and medium-sized enterprises and administrations. For more insights into e-invoicing, read the article Electronic Invoices Streamline Processes & Save Paper in dotmagazine, written by Prof. Georg Rainer Hofmann in conjunction with Meike Schumacher, Project Manager: Economy and Law at the University of Aschaffenburg.